A lightning rod between different cultural valences (high/low, ancient/modern, oriental/occidental), Takashi Murakami has stated that the artist is someone who understands the borders between worlds and who makes an effort to know them. With his distinctive “Superflat” style and ethos, which employs highly refined classical Japanese painting techniques to depict a super-charged mix of Pop, animé and otaku content within a flattened representational picture-plane, he moves freely within an ever-expanding field of aesthetic issues and cultural inspirations. Parallel to utopian and dystopian themes, he recollects and revitalizes narratives of transcendence and enlightenment, often involving outsider-savants. Mining religious and secular subjects favored by the so-called Japanese "eccentrics" or non-conformist artists of the Early Modern era commonly considered to be counterparts of the Western Romantic tradition, Murakami situates himself within their legacy of bold and lively individualism in a manner that is entirely his own and of his time. Murakami is also a curator, a cultural entrepreneur, and a critical observer of contemporary Japanese society. In 2000, he organized a paradigmatic exhibition of Japanese art titled “Superflat,” which traced the origins of contemporary Japanese visual pop culture in historical Japanese art. He has continued this work in subsequent impactful exhibitions such as “Coloriage,” (Fondation Cartier pour l'art contemporain, Paris, (2002); and “Little Boy: The Art of Japan's Exploding Subcultures,” Japan Society, New York (2005). 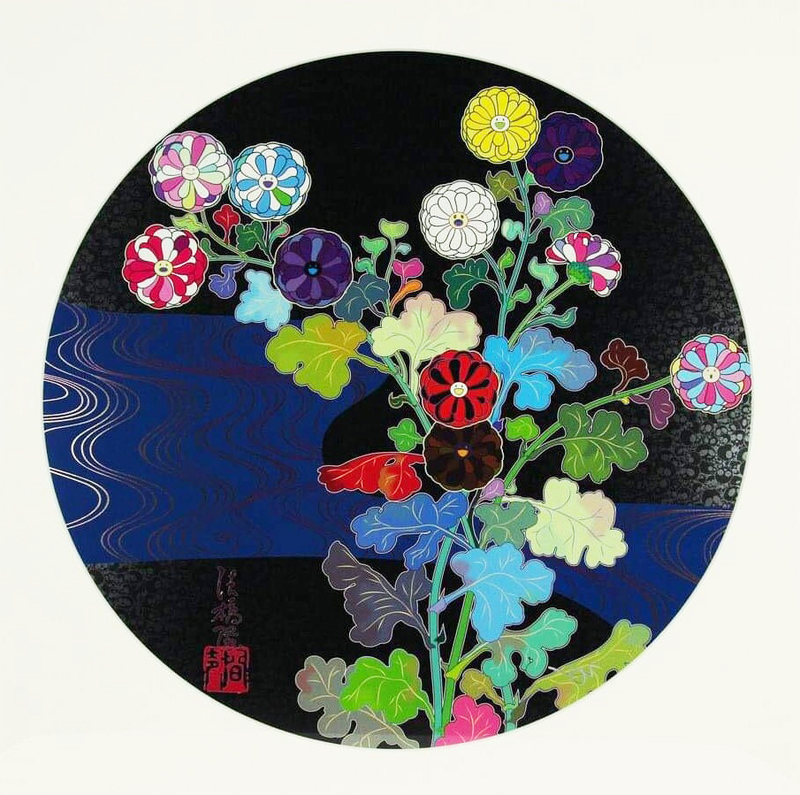 In 2011, he organized the "New Day: Artists for Japan" international charity auction at Christie’s New York in response to the 2011 Tōhoku earthquake and tsunami. 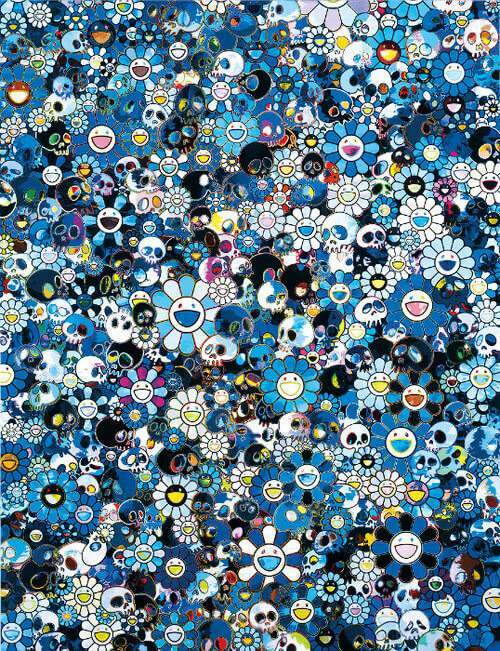 Takashi Murakami was born in 1962 in Tokyo, Japan. He studied at Tokyo University of the Arts, Japan, (formerly, Tokyo National University of Fine Arts and Music), where he received his P.h.D. in 1993. He founded the Hiropon factory in Tokyo in 1996, which later evolved into Kaikai Kiki, an art production and art management corporation. 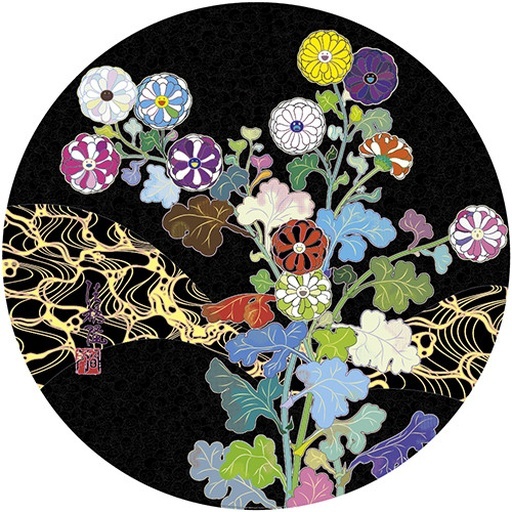 In addition to the production and marketing of Murakami's art and related work, Kaikai Kiki functions as a supportive environment for the fostering of emerging artists. Murakami currently lives and works in Tokyo and New York City. In 2000, Murakami published his "Superflat" theory in the catalogue for a group exhibition of the same name that he curated for the Museum of Contemporary Art, Los Angeles. The theory posits that there is a legacy of flat, 2-dimensional imagery from Japanese art history in manga and anime. 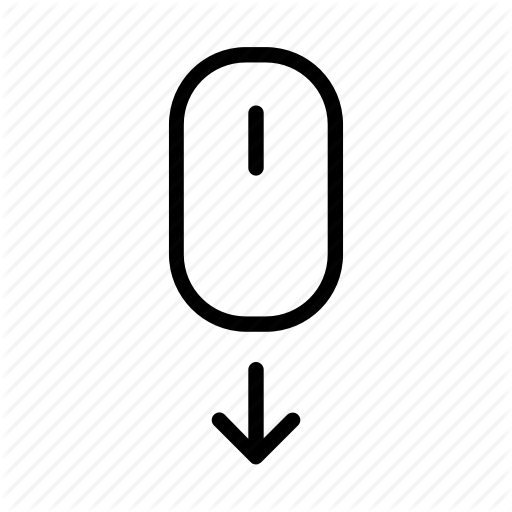 This style differentiates itself from the western approach in its emphasis on surface and use of flat planes of color. Superflat also served as a commentary on post-war Japanese society in which, Murakami argues, differences in social class and popular taste have 'flattened,' producing a culture with little distinction between 'high' and 'low'. The theory provided the context for his work and he elaborated on it with the exhibitions "Coloriage" (2002, Fondation Cartier pour l'art contemporain, Paris) and "Little Boy: The Arts of Japan's Exploding Subculture" (2005, Japan Society, New York). These helped introduce Japan's lesser-known creative culture overseas and such curatorial projects would become an integral part of Murakami's multifaceted artistic practice. In accordance with the Superflat concept, Murakami's practice involves repackaging elements usually considered "low" or subcultural and presenting them in the "high-art" market. He then further flattens the playing field by repackaging his "high-art" works as merchandise, such as plush toys and T-shirts, making them available at more affordable prices. Murakami's art encompasses a wide range of media and is generally described as superflat. It has been noted for its use of color, incorporation of motifs from Japanese traditional and popular culture, flat/glossy surfaces, and content that could be described at once as "cute", "psychedelic", or "satirical". Among his best known recurring motifs are smiling flowers, iconic characters, mushrooms, skulls, Buddhist iconography, and the sexual complexes of otaku culture. In addition to large paintings such as 727 (permanent collection Museum of Modern Art, New York) and Tan Tan Bo Puking – a.k.a. Gero Tan, he has also produced sculptures, balloons, 'all-over' wallpaper installations, animated works, prints, posters, and assorted merchandise. On June 21, 2011, Google featured a doodle tagged as "First Day of Summer" which was created by Murakami. This was accompanied by a Winter Solstice doodle for the Southern Hemisphere. Takashi Murakami is unquestionably the most famous artist in the world of Japanese contemporary art. He owes much of his success to hard work and a lack of sleep. “If I relax for more than six hours, I feel like I’m being extremely lazy and I have to get back to work. I can’t really relax,” he told us. The relentless output of new works, sculptures, and exhibitions crafted by himself and his global team of 300 Kaikai Kiki Gallery assistants is driven by one simple dread: “I fear that people will get bored of me,” he said. We shadowed Murakami for three consecutive days prior to his massive “HEADS⟷HEADS” exhibition at New York City’s Galerie Perrotin. From observing the unreal synchronization of workers at his L.I.C. studio to encountering crazed fans at his meet-and-greet for the Uniqlo UT Doraemon collaboration, we offer viewers a rare look at the artist responsible for the limelight. 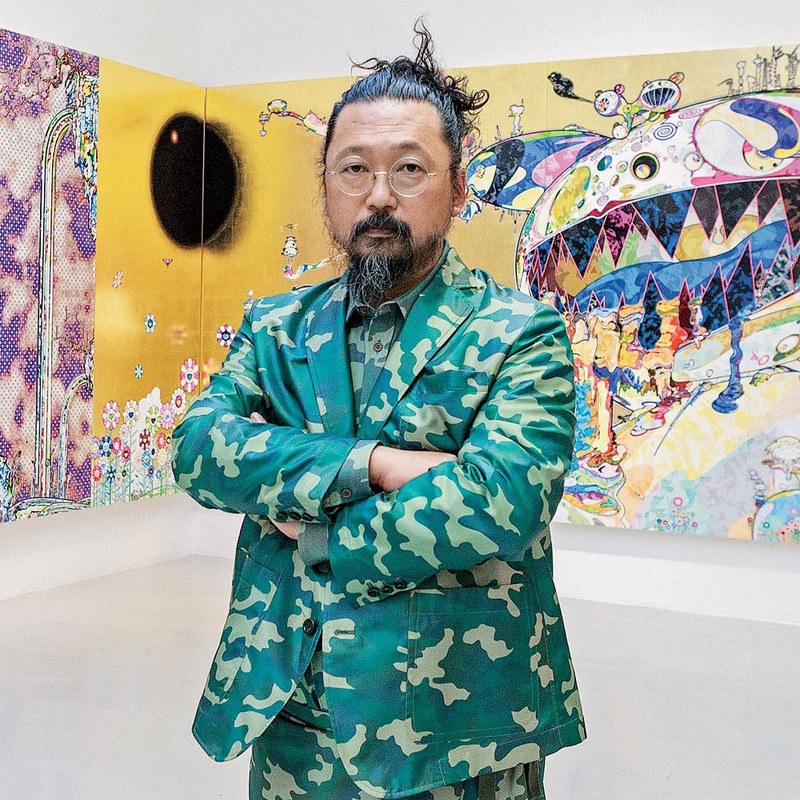 In his New York City studio, Takashi Murakami discusses his three-decades-long practice in which he blends traditional and modern art techniques to create enormous paintings with a visual power unmatched in contemporary art. Murakami talks about his position as an outsider in the Western contemporary art world and his interest in breaking down the boundaries between art and popular culture through collaborations with Kanye West, Louis Vuitton, and Complex. Michael Darling, James W. Alsdorf Chief Curator, is also featured in the video and discusses Murakami's history and accomplishments. They each delve into the origins of Murakami's iconic Mr. DOB, as well as his influences, including Star Wars, natural disasters, and fashion branding.